This is the second in a series of posts on how to build a Data Science Portfolio. You can find links to the other posts in this series at the bottom of the post. Blogging can be a fantastic way to demonstrate your skills, learn topics in more depth, and build an audience. There are quite a few examples of data science and programming blogs that have helped their authors land jobs or make important connections. Blogging is one of the most important things that any aspiring programmer or data scientist should be doing on a regular basis. Unfortunately, one very arbitrary barrier to blogging can be knowing how to set up a blog in the first place. In this post, we’ll cover how to create a blog using Python, how to create posts using Jupyter notebook, and how to deploy the blog live using GitHub Pages. 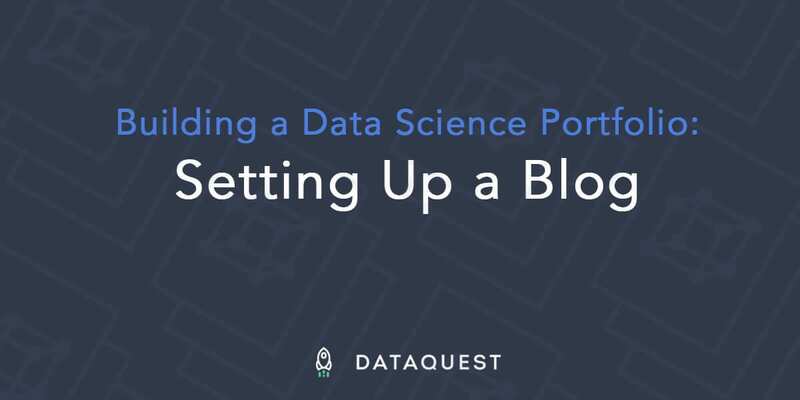 After reading this post, you’ll be able to create your own data science blog, and author posts in a familiar and simple interface. Manually editing HTML is incredibly painful. If you want to make multiple posts, you have to copy over styles, and other elements, like the title and footer. Generally, when you’re blogging, you want to focus on the content, not spend time fighting with HTML. Thankfully, you can create a blog without hand editing HTML using tools known as static site generators. This is the first post in what will soon become (if it already isn't) the best blog. Future posts will teach you about data science. This is much easier to manage than the HTML file! Common elements, like the title and the footer, can be placed into templates, so they can be easily changed. There are a few different static site generators. The most popular is called Jekyll, and is written in Ruby. Since we’ll be making a data science blog, we want a static site generator that can process Jupyter notebooks. Pelican is a static site generator that is written in Python that can take in Jupyter notebook files and convert them to HTML blog posts. Pelican also makes it easy to deploy our blog to GitHub Pages, where other people can read our blog. Before we get started, here’s a repo that’s an example of what we’ll eventually get to. Create a folder — we’ll put our blog content and styles in this folder. We’ll refer to it in this tutorial as jupyter-blog, but you can call it whatever you want. Create a file called .gitignore, and add in the content from this file. We’ll need to eventually commit our repo to git, and this will exclude some files when we do. Run pip install -r requirements.txt in jupyter-blog to install all of the packages in requirements.txt. Run git init to initialize the current folder as a git repository. Run git submodule add git://github.com/danielfrg/pelican-ipynb.git plugins/ipynb to add in the plugin. These lines tell Pelican to activate the plugin when generating HTML. Create a Jupyter notebook with some basic content. Here’s an example you can download if you want. Copy the notebook file into the content folder. Create a file that has the same name as your notebook, but with the extension .ipynb-meta. Here’s an example. Summary: My first post, read it to find out. Title — the title of the post. Slug — the path at which the post will be accessed on the server. If the slug is first-post, and your server is jupyter-blog.com, you’d access the post at http://www.jupyter-blog.com/first-post. Date — the date the post will be published. Category — a category for the post (this can be anything). Tags — a space-separated list of tags to use for the post. These can be anything. Author — the name of the author of the post. Summary — a short summary of your post. You’ll need to copy in a notebook file, and create an ipynb-meta file whenever you want to add a new post to your blog. Switch to the jupyter-blog folder. Run pelican content to generate the HTML. Switch to the output directory. Visit localhost:8000 in your browser to preview the blog. You should be able to browse a listing of all the posts in your blog, along with the specific post you created. Sign up for GitHub if you haven’t already. Create a repository called username.github.io, where username is your GitHub username. Here’s a more detailed guide on how to do this. Add the repository as a remote for your local git repository by running git remote add origin [email protected]:username/username.github.io.git — replace both references to username with your GitHub username. A GitHub page will display whatever HTML files are pushed up to the master branch of the repository username.github.io at the URL username.github.io (the repository name and the URL are the same). Edit SITEURL in publishconf.py, so that it is set to http://username.github.io, where username is your GitHub username. Run pelican content -s publishconf.py. When you want to preview your blog locally, run pelican content. Before you deploy, run pelican content -s publishconf.py. This uses the correct settings file for deployment. If you want to store your actual notebooks and other files in the same Git repo as a GitHub Page, you can use git branches. Run git checkout -b dev to create and switch to a branch called dev. We can’t use master to store our notebooks, since that’s the branch that’s used by GitHub Pages. Create a commit and push to GitHub like normal (using git add, git commit, and git push). Run ghp-import output -b master to import everything in the output folder to the master branch. Use git push origin master to push your content to GitHub. Try visiting username.github.io — you should see your page! Whenever you make a change to your blog, just re-run the pelican content -s publishconf.py, ghp-import and git push commands above, and your GitHub Page will be updated. Comments are one way to interact with your guests. Disqus is a good tool for this, and it integrates with Pelican seamlessly. Go to the Disqus site and register. Click “Get Started”, then choose “I want to install Disqus on my site”. Choose a Disqus subscription plan — a basic plan is perfect for a personal blog. When Disqus asks which platform your site is on, scroll down and choose “I don’t see my platform listed, install manually with Universal Code”. On the Universal Code page, scroll down again and click “Configure”. On the Configure page, fill in the “Website URL” section with your actual website address (https://username.github.io). You can also add information about your comment policy (if you don’t have one, Disqus gives suggestions), and enter a description for your site. Click “Complete Setup”. You’ll now have the ability to configure your site’s community settings. Click into this section and look around. Among other things, you’ll be able to control whether guests can comment, and activate ads. In the toolbar on the left, click “Advanced” and add your website into Trusted Domains as username.github.io. Lastly, update publishconf.py. Make sure to specify DISQUS_SITENAME = "website-name", where “website-name” comes from step 3. Now rerun the pelican content -s publishconf.py, ghp-import output -b master and git push origin master commands to update your GitHub Page. Refresh your website and you’ll see Disqus appearing under each post. The Pelican community offers a variety of themes at pelicanthemes.com. Keep it simple. The design should not distract from the actual content. Remember the “Rule of Three Colors”. According to University of Toronto study, most people prefer combinations of two to three colors. This way colors don’t fight for attention. Pay attention to the width of your page — it should be enough to contain infographics and code that you may want to publish. git clone --recursive https://github.com/getpelican/pelican-themes pelican-themes. Here, we are using a nice flex theme by Alexandre Vincenzi. Run the usual finishing commands — pelican content, ghp-import, and git push — and enjoy a new look! We’ve come a long way! You now should be able to author blog posts and push them to GitHub Pages. Anyone should be able to access your blog at username.github.io (replacing username with your GitHub username). This gives you a great way to show off your data science portfolio. Using username.github.io is nice, but sometimes you want a more custom domain. Here’s a guide on using a custom domain with GitHub Pages. Check out the list of plugins here. Plugins can help you setup analytics, commenting, and more. Trying promoting your blog posts on sites like DataTau, Twitter, Quora, and others to build an audience. At Dataquest, our interactive guided projects are designed to help you start building a data science portfolio to demonstrate your skills to employers and get a job in data. If you’re interested, you can signup and do our first module for free. Building a machine learning project. 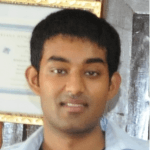 The key to building a data science portfolio that will get you a job.